no matter if beginner or advanced - we will surely find a way to awaken the fun of snowboarding in you. In addition to the beginner and advanced courses, our qualified coaches also offers intensive private lessons to improve your skills as quickly as possible. 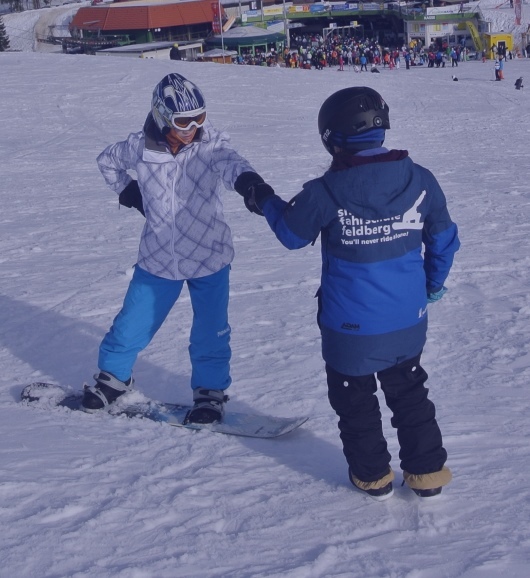 Our snow school is located at the foot of the most lavish and snow-secure slope at the Feldberg, the Seebuck. You will find us only a few minutes away from the car park or the Feldberger Hof, right adjacent to the slope. 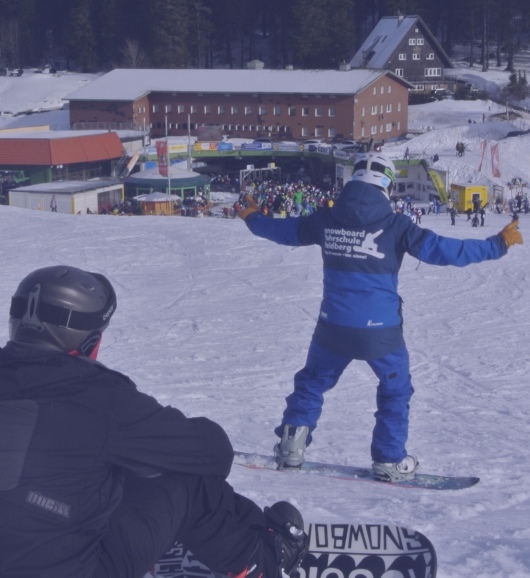 The Seebuck is regarded as a family slope within the ski resort and as such provides perfect conditions for our Kinderland and has ideal practice slopes for groups and individuals. Goal: Safe stopping and braking. Knowledge about equipment, terrain & skiing safety. Goal: Mastering blue runs comfortably. Knowledge about the safe usage of the resort lifts. Goal: Comfortably linking turns with parallel skis. Knowledge about safety rules on the slopes. Goal: You are comfortable all over the mountain. Knowledge about terrain and risk management. Where is the Snow School located? Follow the route to the 'Feldbergbahn' and the new Feldberg car park! The car park is only 200m from the slope and our snow school. We do also have a detailed description! 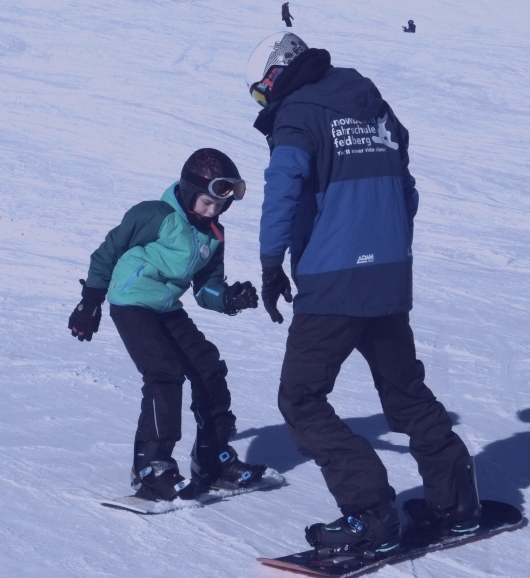 What is the registration deadline for Snowboard lessons? Registration deadline is 9:00 am on the day of the course. You are also welcome to book your course on the day before with us! So that everything works, you should be on the spot during the holidays or on weekends at least 1.5 hours before the course starts! Please note that the number of participants is limited! All fares regarding our lessons can be found beneath SCHOOL and respective selection of your chosen type of sport. You may add items to your shopping basket without commitment, keeping an eye on your costs! What is the minimum age requirement for my kids? Kids from 4 years old may participate in our group lessons. We recommend private lessons to younger kids to dabble in beforehand. What do I need to do to partake in offered lessons? Use the offered online-shop form for your registration of any kind of lessons with us. Simply add your requested items, lessons and or rental equipment, into your shopping basket and notify us of any special requests. When can I book private lessons? In high season (holiday season & weekends) we offer private lessons hourly. You can book these online, too! Also in the low season on individual times on request! Where is the rental store located? The rental store is located in the same premises as our snowboard school. The all-round package from a single source, right on the slopes! You can also book rental material easily and conveniently online! "Thoma" is a concept for me! I want to know more! Group lessons require a minimum of 4 participants, lower numbers qualify as private lessons. Lessons generally start daily. Lessons will be offered daily during peak season, as long as the 4 person minimum requirement is met and after consultation. Half day lessons cannot be combined with full day lessons. Helmets are free of charge for kids! Lengths and duration of lessons may vary depending on the respective instructor.